shows small dancing skeletons in mockery of permanency. Fundamental to Tibetan Buddhist practitioners are the Four Foundations, four topics that are meditated upon as a preliminary practice in order to overcome attachment and develop a firm spiritual foundation and generate keen motivation. The first contemplation is on ‘precious human birth/existence’ is how rare and difficult it is to obtain and how easily it can be lost, such condition of fragility leads onto the next contemplation of ‘impermanence’ that how everything is in constant change and deterioration. 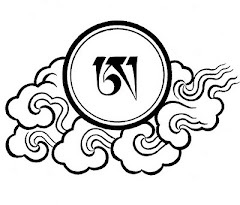 The third is to reflect upon the law of ‘Karma’ cause and effect, being primarily the driving force of Samsara; is the fourth contemplation on the suffering of ‘cyclic existence’ the entrapment of the attachment to material possessions and the expectation and disappointment of loved ones, which continuously grips ones habitual attention. Tashi Mannox illustrates the ‘four foundations’ as a set of four calligraphic masterpieces, intended to be thought provoking as a subject of meditation and reflection, that can be an aid to ones practice if not a pleasing iconographic art piece for the wall. Appreciate precious life, as it is difficult to obtain and easily lost. As a seed, the essence of life, uncoils in growth, delicate, precious and whole. 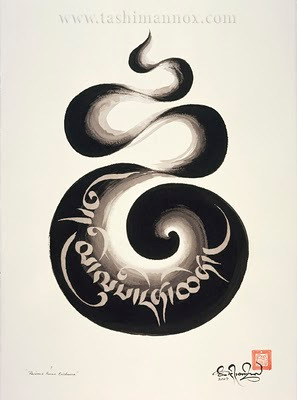 This curling Bindu shape, Sanskrit, Tigli in Tibetan, holds the words ‘precious human birth’ in a Tibetan Drutsa script. The words ‘mi rtag pa’ impermanence in the toppling Tibetan Tsugring script, are made up small dancing skeletons, which fade into decay at the base of the letters. 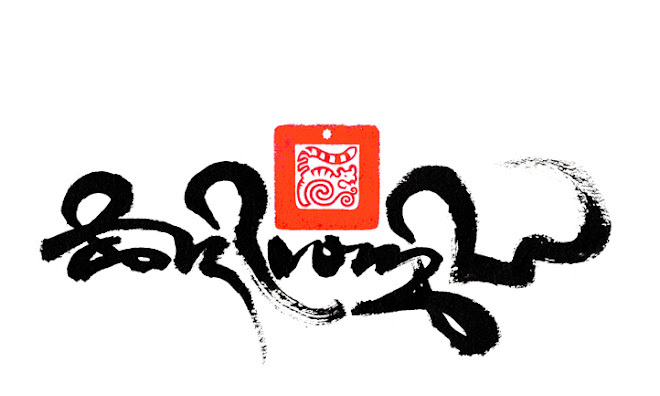 The personal seal of the artist is also broken into two. The heavy dept of past negative actions are always collected by the law of Karma. Equally any positive actions accumulated will result in the fruition of good Karma. There is no rule in time to say when good and bad Karma will ripen, other than all the relevant causes and conditions come together for that particular ‘karma’ to manifest. 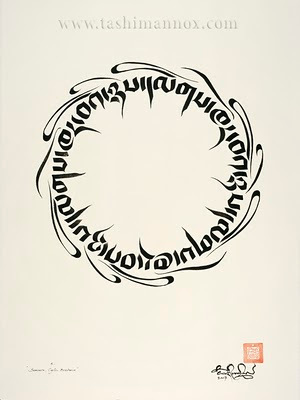 The circle of Tibetan ‘Tsugthung’ script reads “cyclic existence” this repeats relentless with no beginning and no end. Such is the nature of Samsara. 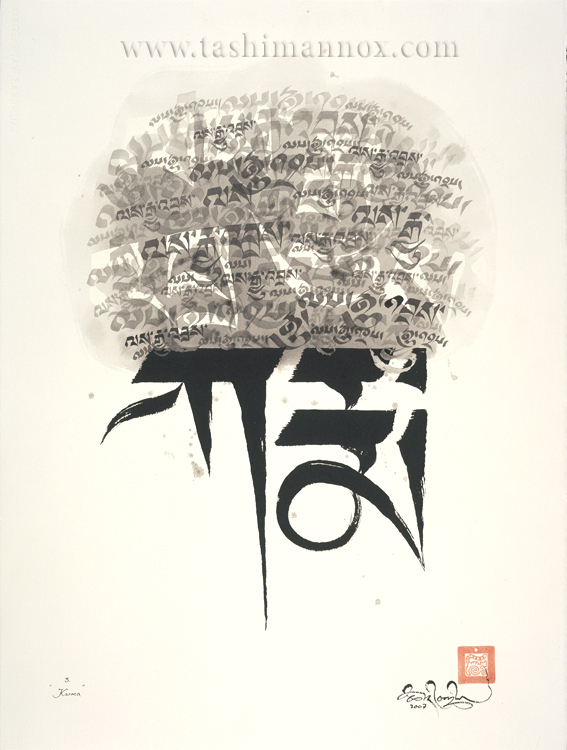 The four Preliminaries are a classical topic for practitioners, which have provided a strong backbone for the more historically famous lineage holders and Saints of Tibet, notably in they're teaching and songs, such as Milarepa and his spiritual son Gampopa. “The cause is the Buddha nature. The support is the most precious human body. The circumstance is the spiritual friend. The method consists of his instructions. The result consists of the kayas of perfect Buddhahood. The activity is the spontaneous accomplishment of beings’ benefit.” From the ‘Jewel Ornament of Liberation’ Jé Gampopa. The above images of the four Contemplations are available as a set or individually as limited edition prints, these are personally hand signed and sealed by the artist. 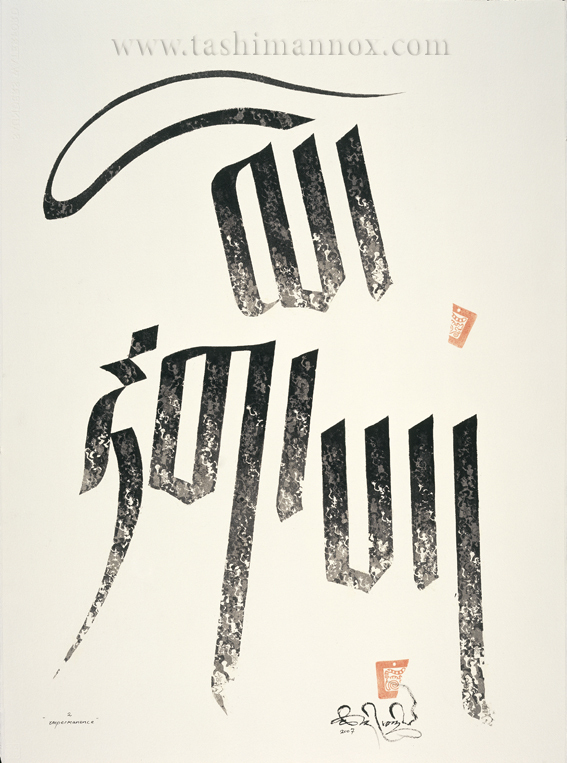 Prints can be ordered in two sizes. The larger size being near to the actual size of the original artworks of approximately 67x50 cm. The smaller size prints are approximately half the shown size. For more information such as prices and how to order, please visit the link here.